I am interested in improving human interaction with computer systems through empirical investigations of how computers are used and through explorations of innovative user interfaces. My publication list gives an impression of my research interests, as does this sketch of my current research. In 2015 I was awarded an ERC Consolidator grant to work on body-based user interfaces. Kasper Hornbæk received his M.Sc. and Ph.D. in Computer Science from the University of Copenhagen, in 1998 and 2002, respectively. Since 2014 he has been a professor at University of Copenhagen. His core research interests are human-computer interaction, usability research, and body-based interactions; detours include eye tracking, cultural usability, and reality-based interfaces. 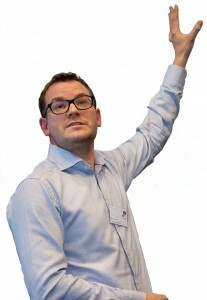 Kasper serves on the editorial board of ACM Transactions on Computer-Human Interaction. He has published at CHI, UIST, ACM Transactions on Computer-Human Interaction, and Human-Computer Interaction, and won IJHCS’s most cited paper award 2006-2008.